SAN FRANCISCO, March 22, 2017 /PRNewswire/ — Trulia, a leading destination for homebuyers and renters, today released the findings from the Trulia® Inventory and Price Watch. This quarterly look at the supply of starter, trade-up and premium homes on the market nationally and in the 100 largest U.S. metros found that markets with the biggest gains in home values since 2012 are facing the tight supply of for-sale homes. Nationally, housing inventory hit its lowest level on record in the first three months of 2017. The number of homes on the market dropped for the eighth consecutive quarter, falling 5.1% over the past year. Across different housing segments, starter and trade-up home inventory fell 8.7% and 7.9% year-over-year nationally. Meanwhile, the stock of premium homes remained relatively unchanged since last year, having fallen just 1.7%. This persistent and disproportional drop in starter and trade-up home inventory continues to make homeownership less affordable – especially for first-time buyers. 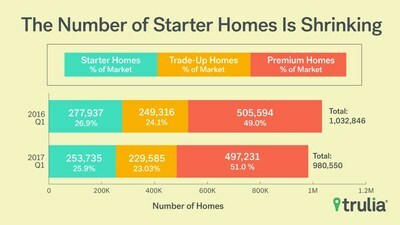 A typical starter-home buyer would need to dedicate 38.3% of their monthly income to buy a starter home – a 2.9-point increase from last year. Trade-up and premium homes, on the other hand, are still relatively affordable despite being more expensive. Among the 100 largest U.S. metro areas. Share is the percent of for-sale homes that fall into each segment, which is defined separately for each metro. Median price for each segment is the stock-weighted average of the median price of each segment in each metro. Some point change estimates may be slightly different than stated values because our differing procedure occurs before rounding. A strong recovery may be partly to blame for the large drop in inventory some markets have experienced over the past five years. Housing markets – including San Francisco, Seattle, Nashville, Tenn. and Colorado Springs, Colo., – which have had greater home value recovery since 2012 have experienced larger decreases in inventory. In other words, not only are buyers in the hottest markets likely to be priced out, potential sellers may be locked in to their existing homes. NOTE: Among 100 largest U.S. metros. Full data set available here. Housing stock value relative to peak is the current total value of each market’s housing stock relative to its pre-recession peak value. See methodology for details of calculation. The Trulia Inventory and Price Watch offers buyers and sellers deeper insight into the change in supply and affordability of homes over the past year, within three different segments of the market: starter homes, trade-up homes, and premium homes. Based on the for-sale homes listed on Trulia, this report calculates housing inventory within each segment nationally and in the 100 largest U.S. metros, from Jan. 1 to March 1, 2017. For the full report and methodology, see here. Trulia® is a vibrant home shopping marketplace, focused on giving homebuyers, sellers, and renters the information they need to make better decisions. On mobile and the Web, Trulia provides house hunters with insights and unique information about properties, neighborhoods, and real estate agents. Additionally, Trulia offers data and information about schools, crimes, commute times, and the real estate market. Launched in 2005, Trulia is based in San Francisco and is owned and operated by Zillow Group (NASDAQ: Z and ZG).